This is a small quilt that I finished in October but forgot to post about. This quilt was made from scraps left from a much larger project. 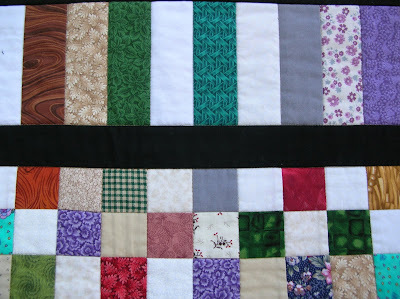 The larger project was Nine Patch Path and was finished and given to my MIL on May 2, 2007. I love using up all the last little quilt bits and making something useful out of them. Even the batting used in this project was made from leftovers pieced together from many larger projects. This is a customer quilt that I recently finished. 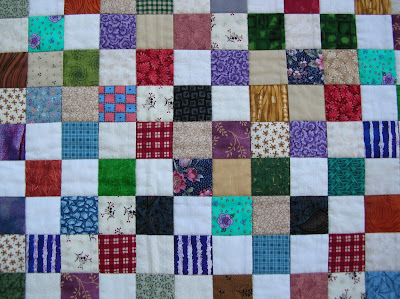 I am always on the lookout for quilt designs that can be converted quickly into interesting quilts. It seems these days that the time I have available to work on my own quilts is less and less. I don’t have the time to devote to those heirloom quilts right now. There are many bloggers out there making donation quilts for one of the many needy organizations and so I thought you might enjoy looking at another idea. 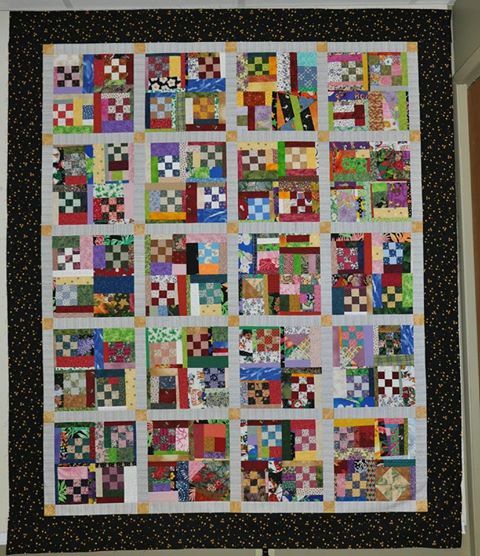 This quilter set the blocks together with 2″ sashing strips and cornerstones and finished the quilt off with a 2″ inner border and a 5″ outer border. The fabrics in this quilt definitely add interest to an other wise simple quilt block, but the formula works. Last Saturday at our guild workshop, I offered to help Kathy with her machine quilting. I brought along some of my smaller quilts to demonstrate that there is a lot you can do to machine quilt your quilts with your domestic sewing machine (DSM) and your walking foot. Kathy commented that she should be writing down the ideas. No need to make notes, these pictures are posted for you, Kathy. 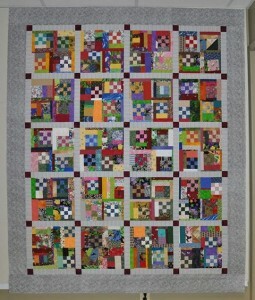 This first quilt is a rail fence miniature. As long as the curves or arcs are gentle, they can be accomplished quite nicely with a walking foot and there is no need to drop the feed dogs and wrestle with controlling the stitch length and moving the quilt at a steady speed while stitching in free motion. This quilt was marked with a blue marking pen using the edge of a glass to make the arcs across two strips. This picture shows the closeup of the stitching on the blocks. This is the back of the same quilt. The scallop design on the border was accomplished with a stencil. Again the curve is gentle and easily accomplished with the walking foot. The secondary design was not intentional and has the appearance of the apple core block. The alternate squares in this miniature nine patch were stitched to look like the nine patch blocks–simple straight lines. I love it when a secondary design that wasn’t part of the original quilt plan emerges in my quilts. When I finished this log cabin quilt and showed it to my husband he declared that he could find the surprise in my quilt–the birds. 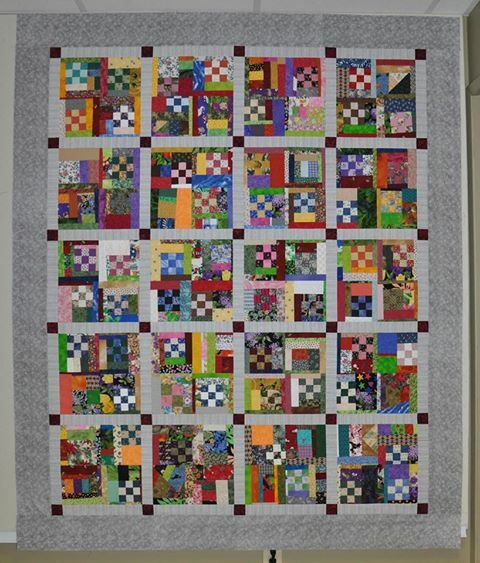 This quilt was a simple two colour log cabin and there was no intention on my part to arrange the blocks to form four birds in the four corners of the quilt. Further to that, without realizing it, my quilting accentuated the bird image. Simple parallel lines at an consistent angle finish off the border. I believe they call the block in this quilt, Sister’s Choice. This is my favorite technique for a narrow sashing or border–a serpentine stitch. This stitch is a modified zig zag type stitch on my Bernina. 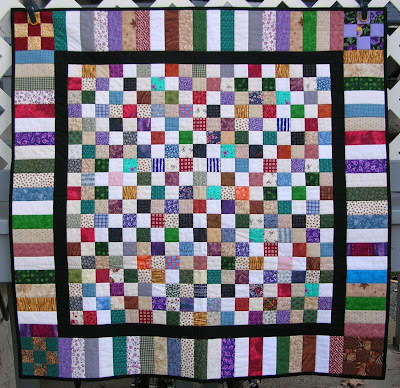 The border quilting on this quilt is straight lines at a consistent angle spaced in alternating narrow and wide widths.